When you do not get the job you wanted so badly, when your colleague gets the promotion instead of you, when someone says no when you ask for a date, it hurts! Rejection hurts! It makes us feel bad. No one likes it. As you move from kindergarten, through high school, then college and finally into adulthood you will be rejected from time to time. Rejection is part of life. No one likes it because we believe it is the result of our flaws – real or imagined. The only effective way to deal with rejection is to learn from it. When rejection comes your way, the first thing you should do is question – “Why did that happen?” And, I don’t mean obsessing about it for hours and hours. Sometimes you can figure out the answer to the question and sometimes you can’t. But, when you can, you have a choice to make – is the reason something you want (and are willing) to change, or not. Rejection gives you a chance to be honestly introspective, to look at your life and decide whether the rejection is the result of something you can change – and if so, do you want to change it. Who do you want to be – and what do you want out of life? Would such a change serve your best interests, or is the rejection based on someone else’s idea of how they think you should be – or expect you to be? Rejection is an action taken based on someone else’s opinion – and they are not necessarily right. Often times, they don’t even know you. Or, it could be based on some frivolous or societal expectation that means nothing. You need to think it through, maybe even ask some questions, and make a decision about what to do with the information you discover, if anything. If you have been in the job market for a while, chances are you have interviewed for a job that you were not really qualified for – or, you were very qualified, but not very interested. When such rejections happen, you have been given an important gift. If you are not qualified and are hired anyway, it is unlikely that you would do well and the job probably wouldn’t last. Of course, if you are a quick learner and they are willing to train you (which is uncommon in the current business environment), it could be OK. BUT . . . on the other hand, if you are rejected and it is a job that holds great interest for you, it may be the catalyst you need to get the necessary training so you can apply again and get hired. If you are burnt out, not being hired is a blessing because it may wake you up to the fact that you need a change. Professionally, most rejection should not be taken personally. If you are not being rejected for personal hygiene, perpetual tardiness, lack of discipline, lack of language facility, or other things that you can change, you really need to develop a tougher skin and keep moving on. Every good sales person will tell you that sales is a numbers game. 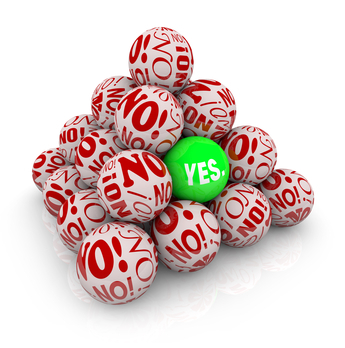 You have to go through many no’s in order to get to a yes. And . . . in the professional world practically everything is a sales job. You are always selling yourself first and the product or service second. When you study every rejection and think what you did or didn’t do and analyze why the person may have said no, there is much to be learned. For example: If you are a salesman and constantly hearing no, do you need to learn more about your service/product, do you need to adjust your approach or your pitch, or are you approaching the wrong market? As a car salesman you would not try to sell cars to people who cannot drive. Chances for success would be minimal and rejection would be the norm. On the other hand, if you have a great product or service and target a market that is hungry for what you are selling, getting to “yes” should be fairly easy. Being willing to look at what you are doing and understanding the reasons why you are hearing so many “no’s” can give you the information you need to change and avoid constant rejections in the future. If you are afraid of rejection, it is time to get over it. Use it as a tool to get more of what you want out of life, rather than let it discourage and defeat you. The only way to success is by facing and overcoming challenges. Dealing with rejection can be one of life’s biggest challenges. Accept it, learn from it, and keep moving forward. Use rejection to succeed.